VANCOUVER, British Columbia, March 08, 2019 (GLOBE NEWSWIRE) -- JPC Services Inc. is pleased to announce that the third “Winter Warm Wave” event was a complete success! On Sunday, February 3, 2019, the temperature was in the sub-zeros in the Greater Vancouver area, making it one of the coldest days this winter, but warmth flowed through the streets of Richmond, emanating from the Brighouse Skytrain Station, where the “Winter Warm Wave” event was held, with around 200 volunteers distributing gifts and sweets on the street, writing spring festival couplets, and singing and dancing, creating an enthusiastic and warming atmosphere, attracting over one thousand attendees. The event began at two o’clock in the afternoon, by the exit of the Brighouse Skytrain Station. Two huge inflatable gods overlooked the streets, both laughing joyously, accompanied by cheerful and lively New Year music, filling the streets with the joy of the New Year. Elderly folk from the second branch of the Senior Chinese Society of Vancouver were dressed in various traditional Chinese garments they danced, waving their pink fans. Volunteers were stationed in several booths, handing out small gifts and New Years sweets to the public, attracting many people who just exited the skytrain station. Parents who brought children to participate in the activities were very happy, and many families spoke well of the calligraphy and couplets, taking the opportunity to let their children to better know the uniqueness of the Chinese culture. Many promptly started dancing as the music turned on, disregarding any borders that the concept of ethnic groups imposes, and simply held hands to enjoy the rhythm of the music. In addition to song and Latin dance celebrations, there were also preparations for Chinese medicine clinics and face painting sessions, canceled only because the weather. There were various other booths from non-profit organizations, including mental health organizations and Indian dance organizations. Nelson Jiang, Media Speaker for the event, has said that this was the third time that this event was held, from only 28 volunteers in the first year to now around 200 volunteers in the third, with much diversity in the cultural backgrounds of the attendees, showing the recognition that this event has received. The purpose of this event is to share the joy of the Lunar New Year with people from various ethnic groups in Canada, hoping to improve the impression that the Chinese has in mainstream society. Nelson has said that when it comes to Chinese people, the outside world typically criticizes bad conduct and behaviors, such as real estate speculation and money laundering, when, in fact, the Chinese have done many good deeds as well, albeit in a much more discreet manner. Many of these actions go unseen, allowing the few negative news prevail, overshadowing the good deeds. Another Media Speaker, Mrs. Li, is especially grateful to the volunteers for their charitable efforts. Li said, "Today’s event is meant to bring together not only the Chinese community of Richmond and the surrounding regions, but the community as a whole. People can come together and enjoy food, drinks, and activities with one another, sharing warmth and joy, embodying the spirit of the Lunar New Year. 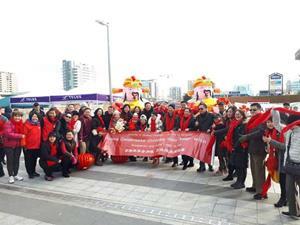 This event was truly a great way to spread the Chinese culture and share it with other members of the community. For myself, since I was in Canada when i was 13, Chinese culture has been a part of my life and my identity. I hope from this event, promoting Chinese traditional culture and custom will bring more people to fall in over with this culture." Mrs. Sang donated socks, lanterns, gloves, lucky dolls, pendants, decorations, and various other items. Many people from Marpole came to volunteer and donated socks to help the homeless. Jeff Jiang has participated as a volunteer since the first year of this event, bringing many people from CCRAC to contribute to the effort. Jeff Jiang came weeks prior and drew out a floor plan and was responsible for the layout of the venue, setting up the booths and amenities provided on the day of the event. Yingzi, Dong Hongchun, Li Hui, Zhang Yonghong and Li Jiaying also contributed to the success of this event. Mrs. Li said that she believes that the “Winter Warm Wave” event will only become more grand as the years pass. The community will not only feel the blessing and warmth of the Lunar New Year, but also recognize the hospitality of the Chinese People. MP Alice Wong and Joe Peschisolido, MLA John Yap, and Richmond City Councilor Chak Au also attended the event to show their love and happiness with the people.